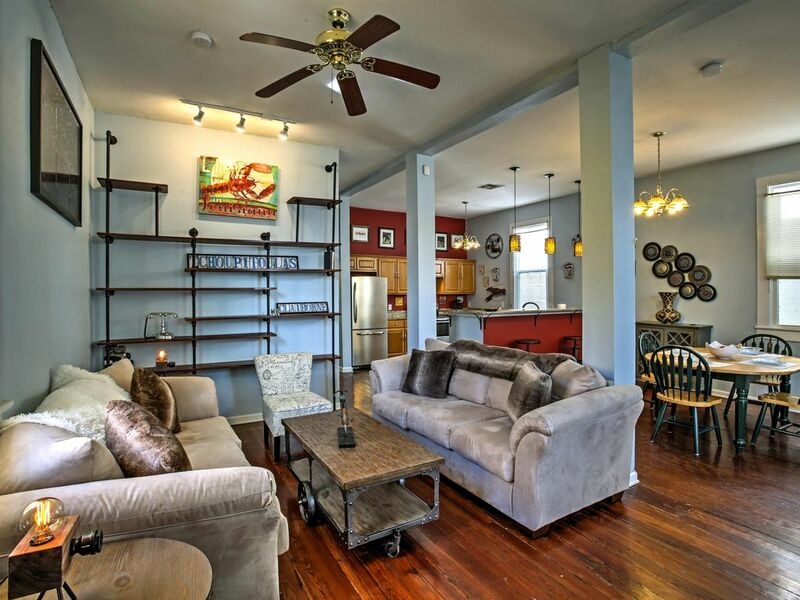 Live like a local in this lovely vacation rental cottage situated in a historic district of New Orleans, just 5 miles and a quick 15-minute drive to the vibrant downtown area. Walk 10 minutes to the oldest streetcar line in the world, discover traditional Creole cuisine, and explore the famous Bourbon Street to get an authentic experience. This 2-bedroom, 2-bath house for 4 includes 1,500 square feet of space, an entertainment center, fully equipped kitchen, and unique decor. The exterior of this quaint New Orleans home boasts historic architecture reflective of traditional Creole cottages. This characteristic feature in addition to the home's decor expressing the city's unique culture, you'll truly be immersed in the authentic New Orleans lifestyle. Kick back and relax in the contemporary living room, acting as an ideal entertainment space. Complete with 2 comfy couches adorned with fur blankets, pillows and a 70" flat-screen Smart TV, you'll love lounging in this tastefully decorated space. The open-concept kitchen and dining area is spacious and colorful, providing a pleasant environment for cooking and eating. When you aren't out on the town feasting on jambalaya or gumbo, try whipping up your own traditional New Orleans meal in this fully equipped kitchen! Rest your head in one of 2 lovely king beds at night. A third room is set up as an office, equipped with a desk and computer in case you need to bring a little work with you on vacation. Don't spend too much time working, though - you'll want to spend as much time exploring New Orleans as possible while surrounded by so many fun activities! You couldn't ask for a better location for exploring this lively city with convenience and ease. Walk 10 minutes to South Carrollton & South Claiborne stop to hop on the famous streetcar line, operating since the early 19th century as the oldest street railway system in the world. Palmer Park also lies nearby and hosts local arts and farmer's markets throughout the year. You can ride the streetcar all the way into downtown or choose the 15-minute drive just 5 miles to Bourbon Street and the famous French Quarter! You can't leave the city without experiencing a night out in this animated bar scene, with a versatile array of pubs, lounges, and clubs that stay open into the early hours of the morning. In addition to the nightlife, the gastronomy in New Orleans is more than worthy of exploring. Banks Street is known for delectable eateries serving up delicious traditional NOLA cuisine. Drive 10 minutes to survey the restaurant options and feast on a bowl of gumbo! Check out the New Orleans Museum of Art located in City Park 3 miles from your vacation rental cottage. You'll love browsing through this attraction, which is the oldest fine arts museum in the city! In an area rich with culture, you can also frequently find rotating art markets and festivals. Love the layout of the house & the hospitality. It’s literally 7-10 minutes from bourbon street. And the property owner is very nice. Will visit again , traveled from Houston and it was worth the stay. Had everything we needed for a enjoyable stay!